I wrote a post detailing the problems with measures Forbes used to call Cleveland the most miserable city. In most respects, we aren't that bad. I thought about the reasons I came back to Cleveland from Baltimore. Of these, housing was foremost. 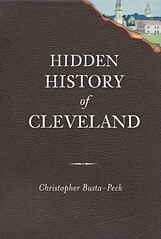 The median house in the Cleveland area, as of March, 2009, sold for $134,680, as compared with $202,300 nationally. At the same time, the median income in the Cleveland area was $47,501, compared with $44,684 nationally. Housing is usually the biggest portion of any family budget. Here, we have incomes slightly higher than the national average, yet our houses only cost 2/3 as much. This leaves more money for us to spend on other things - and isn't that what makes the real difference between misery and happiness? Would you rather live someplace with better weather, have a smaller house, and worry more about making the mortgage payments? Below is the post I wrote originally. When I saw that Forbes called Cleveland the most miserable metro area in the United States, I was surprised. I don't feel miserable. In fact, I feel a lot less miserable than I did in the last city I lived in, Baltimore, Maryland, which didn't even make the list. This puzzled me. My first thought was to wonder what criteria were used to create the list. Unemployment is a problem in Cleveland, as in the rest of the United States. As of December, the unemployment for Cleveland, 8.9%, was actually less than the U.S. average, 10.6%. Our taxes are high. This isn't necessarily bad. Taxes pay for public services - if we want to spend more money on these things, that's our choice. It's why Ohio has the best public libraries in the country. According to the American Community Survey, as of 2008, the Cleveland Metropolitan Statistical Area (MSA) had an average commute time of 23.8 minutes, slightly less than the national average of 25.3 minutes. According to this table, as of 2007, the city of Cleveland had the 13th highest rate of violent crime among the large cities selected. According to Sperling's Best Places, violent crime in the Cleveland MSA as a whole is below the national average. This metric was based on the records of these teams over the past two years, not on ticket sales or amount of enjoyment received from watching the games. If the sports teams made us miserable, we'd stop buying tickets, right? The weather here does leave quite a bit to be desired. It's worth noting that the average January and July temperatures are, according to Sperling's Best Places, relatively close to the national average. The big differences are that we get more precipitation and have more cloudy days. The word can strike fear in some hearts. There's a good side to Superfund program - it gets the most polluted sites cleaned up and forces the polluters to pay for it. This is better than the sites either remaining polluted or having to spend local taxes to clean them up. Forbes based this on the number of convictions of public officials for corruption. Thus, this isn't so much a measure of corruption as either getting caught or of the strength of the local criminal justice system. I think it's ironic that you wrote a post entitled "Why the Forbes Rating Shouldn't Bother You", and yet since then, you've written another post defending the things the Forbes article points out. Clearly, the Forbes article is bothering you. But you're not the only one. The PD also feels it necessary to acknowledge this magazine. Why? Why even give this publication so much attention? It's FREE ADVERTISING for them. Let's face it. Cleveland has a major inferiority complex. It's had its share of embarassments in the past, but it's time to move past those, to brush it off to a certain extent and stop listening to such blatant negativity. Maybe publications like Forbes even knowingly make somewhat offensive claims like these in the effort to sell more magazines in the name of controversy. Cleveland seems to be on the defense quite a bit lately: it's on the defense in the foreclosure crisis. It's on the defense in population loss. And on and on. I think part of the problem is that Clevelanders believe articles like this about themselves, and it's limited their ability to dream. They care too much about what the outside world thinks. I'm not saying that the city shouldn't be open to outside criticism necessarily because outside eyes can provide a fresh perspective. But taking that criticism personally won't help. If Cleveland is going to constantly be on the defensive, it will never be on the offensive. It's been on the defensive for far too long. Thanks for the clarification, and again .. no offense to you or Christopher intended. I appreciate your thoughts and generally enjoy your posts. I'm just infuriated by the amount of attention that magazine receives in the local press every time they release a best/worst whatever. Just because this magazine is from NYC doesn't mean everyone has to get all up in arms over it (and again, this is in NO WAY an attack on you). Let Cleveland be Cleveland, let people be proud of their hometown, and let those other guys say what they want. Them's my two cents, anyway. :) Thanks again! I really like that: let Cleveland be Cleveland. You should put that on a t-shirt and sell it!